Finally, a board game that can be enjoyed by all ages! Dino-Bump is a fun, fast paced game that won the Creative Child Magazine “Seal of Excellence” in 2009 and it is easy to see why it achieved this toy award. 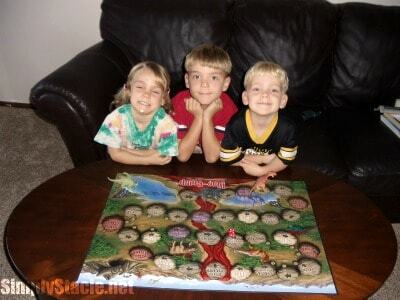 My three children ages 6, 5 and 4 and I love to play games. However, I will admit that playing the same old games becomes a tiresome experience for me and I will often make excuses why I am unable to join in the “fun”. That was not the case with Dino-Bump because it is a family oriented game that is designed for ages 5 to adult and the games can be played in as little as 5 to 30 minutes. My four year old son had no trouble joining in the fun with a bit of coaching and this is their new favorite game……..with all of them requesting to play it several times a day. 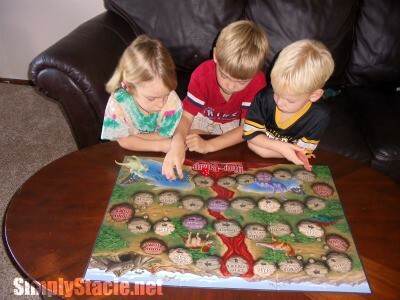 The board is a very sturdy, nice quality with an engaging dinosaur landscape and the pieces are actually six large sized dinosaurs. It is easy to learn how to play as your dinosaur races to be the first to enter the Dino Cave. The kids love being able to send another dinosaur back to the Dino-Bath and the special Dino-Jumps and Dino-Flips are quite a hit. Be sure to pay attention though because the grand finale is a lot of fun! I think this would be an excellent party game for young and old(er) alike too and it is perfect for family game night. Overall, my family really enjoys playing Dino-Bump and as a mom and home educator I am really impressed with this game because it is not only fun but clever and educational too. My young children have been eager to play and in the process they are learning valuable addition and subtraction skills, sportsmanship and the ability the follow instructions. Finally, I am enjoying playing board games again…..thank you LuvyDuvy Corporation! You can purchase Dino-Bump on Amazon.com for only $24.99 and this would make a creative, fun gift idea for the holidays. One lucky reader will receive Dino-Bump from LuvyDuvy Corporation! I had no idea that they were known (and still are known) for their freeze dried ice cream. How fun! The game has won awards three years in a row!! I think it’s neat that they’ve been selling Freeze Dried Ice Cream since 1985. I like the freeze dried ice ream they sell there. I remember that was very popular on an 8th grade trip I went on as a kid. I didn’t know they made the freeze dried ice cream- I ate that when I was younger! I love the freeze dried neapolitan ice cream. I like the Freeze-Dried Ice Cream Sandwich. I learned that the company is located in Coconut Creek, Florida. I hate this game. The rules are very confusing and my kids fight about what a jump is and what a bump is. They are 8 and 10 now and so maybe they are too old for the game. However, the rules should be more clear so we do not have to constantly refer to the rule book. What is with that last space, roll 1 or go back Dino Jump? We have had this game since they were toddlers and I have always disliked it. It only plays ok if you don’t care about rules and are ready to let the child win. I don’t mind going back as long as it it clear and fair.